Let’s go on a treasure hunt! We need to find the Paper Pirate Treasure! Do you have a lot of paper grocery bags shoved in a cupboard at your house? Ever wondered what to do with them? Did you know you can turn them into a Paper Pirate Treasure? Complete with a treasure chest and maps? It’s really just a lot of cutting and gluing. Feel free to decorate it as you want! Use whatever you have around the house. Then, make a map of the designated treasure hunt area. We used a black sharpie. Cut and slightly burned some of the edges. Put a few burn holes in it for an authentic feel, crumpled it up and then got it wet. Let it dry overnight. Load up the Paper Pirate Treasure chest and then hide it! X marks the spot! Paper Pirate Treasure hunts encourage map reading, team work and problem solving skills! Of course, there’s a reward at the end! Spoils to the victorious ones or as my daughter said, “Pirate Cheetos! ARRRRR!“. Even after they had found the Paper Pirate Treasure, my kids played more. They enjoyed hiding it from each other and finding it over and over again. It was fun to make and even more fun to watch my kiddos enjoy the activity! I do this with my kiddos too! First off, I'd love to just have the box. I'm always looking for cool ways to store stuff for our girls, especially mementos and keepsakes. And second, who doesn't love a treasure hunt??? Pinning! She would love this! My kids love Pirate Fairies and Captain Hook, LOL! It was so much fun and not that difficult to make! My son said it was the best activity ever! Nice! Sometimes it's fun to add a crafty surprise! It's amazing what you can do with some paper grocery bag and an old shoe box! Right?! The girls can help decorate it too! Treasure hunts are always fun! Thanks Rea! This can be fun for "kids" of all ages! I loved it too! Thanks Dee! Finding treasure is the best, especially Pirate treasure! No problem! Thanks for pinning, Camille! So cool! 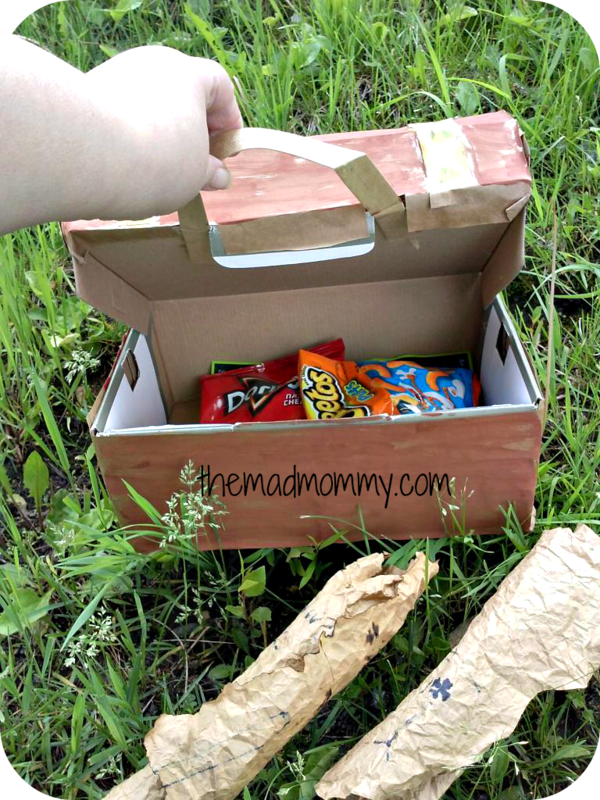 Kids love treasure hunts all the time! Clever what you did with the old shoe box! Thanks so great! 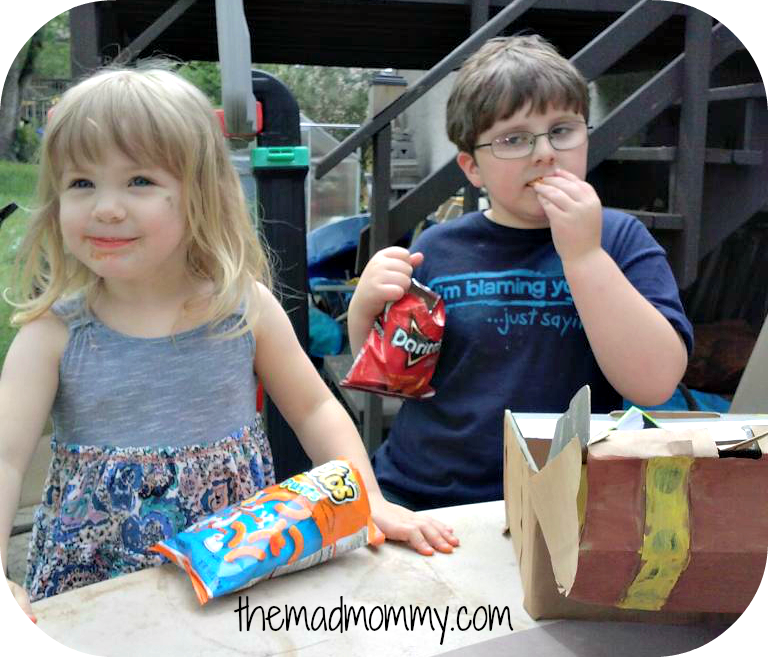 I'm such a bum mom this summer…I haven't done anything fun yet for the kiddos. You have inspired me! what a fun idea! Those pirates sure look happy and satisfied they found the treasure 🙂 Thanks for sharing with us Echo!! I think I will make my own treasure chest! Oh my gosh! This looks so fun! I can't wait until my littles are old enough to do this. Perfect for a Pirate Party. Scarlet would be pretty excited for pirate treasure being Cheetos! And the map! Awesome touch. My son is obsessed with pirates. He would love this! I've been a bum too, but I'm glad I inspired you!!! Oh, they absolutely loved finding the treasure! Thanks for hosting a great party! Isn't reusing stuff great?! Make sure you check out the rest of the series! It would be perfect for a Pirate Party and simple to make! My daughter was so delighted by the Cheetos, LOL! Ahh, the simple things! Isn't the map cool? It's amazing what a sharpie and brown paper bag can do. It was SO much fun, Holly! I love reusing things around the house for fun projects and ideas like this, my kids would love this for a summer activity! What an awesome idea, the kids would love this! That looks like so much fun! My kids love pretending to be pirates. I'm gonna have to see about doing this for them this summer! This is great! Thanks for getting my creative juices flowing so doing this with the kiddos. Oh my goodness! Is this ever cool! So cool. Super cool… and the map… super awesome! Echo, that is super cute!! Way to go …for sure thinking out of the box with this one!! My little boy would love this!! My kids had such a blast with it! My kids love being pirates too! This was so much fun and it's pretty easy to make. The kids were so pleasantly surprised! Thanks Jenn! It's so much fun to get creative sometimes! Hahahaha! I try to keep the plastic bags in another spot! Thanks Jennifer! My kids loved, LOVED the maps! Thanks Kim! It was really fun coming up with the idea and watching it come together! What an awesomely fun idea! Off to share now! Such a great post! So thrilled you chose to share it on the SHINE Blog Hop! Thanks for having me! I always love linking up! Thanks Carrie! That means a lot! Yay! I am so happy you liked it, Emma! Thank you for hosting such a great blog hop! Oh how I only Wish I had little ones to make this for. I love it! FYI, and you probably know, there is a new movie out called Echo! It was so fun and easy! It literally cost me nothing, because I had everything in the house! Make one for yourself! They are fun! Earth to Echo! I am so excited. My son gets excited every time he sees the trailer! What a fabulous and fun idea! Ok, that map makes me want to put on an eye patch this very minute! I will be sharing your wonderful, creative use of paper bags out to the twitter zone. Luv. Visiting you via InspireMeMonday linkup where I get giddy over all things paper. I am seriously, so honored to be featured! Thanks Kimberly! I'll be there! It was so much fun and the kids had a blast! Paper is an amazing medium! My kids will have fun making these! My kids had such an awesome time! Oh wow! Your treasure chest and maps are fantastic! You know we did do our own pirate box but it wasn’t even close to this awesome 🙂 Thanks for linking to our creative craft challenge! 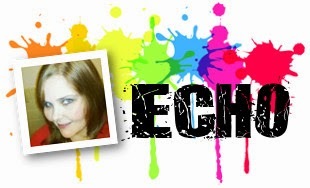 Thanks for sharing this great idea at the creative craft challenge link party, Echo. Love this idea, especially how you left the handle in tact to use as a way of opening the chest. It came out just great. I love your Treasure Chest and the map. What a great activity for the kids! Love this! My kids are constantly asking me to make them a treasure map.